President Nguyen Minh Triet and his Hungarian counterpart, President Solyom Laszlo, have agreed on measures to expand the two countries’ relations in a plethora of fields, particularly trade, development cooperation and investment. 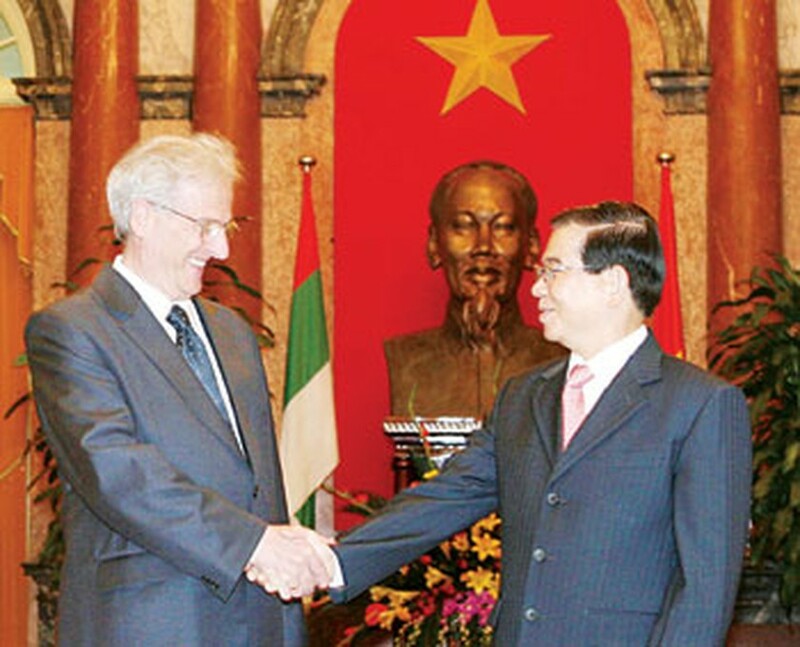 Vietnamese President Nguyen Minh Triet shakes hands with Hungarian President Solyom Laszlo at the Presidential Palace, Ha Noi, May 16, 2008. At their talks held after an official welcome ceremony for Hungarian President Laszlo in Hanoi on May 16, President Triet applauded the Hungarian President’s visit, saying it was a landmark in helping to develop the traditional friendship and multi-faceted cooperation between the two countries in the new period. The two Presidents agreed the Vietnam-Hungary intergovernmental committee for economic cooperation is a pivotal mechanism facilitating exchange of goods, increasing two-way trade turnover and expanding investment of Hungarian businesses in areas of Vietnam ’s interests such as infrastructure construction, planning, urban development, public transport, health care, tourism, education and environmental protection. The two sides commended the signing of a financial framework agreement which will create a legal framework for the implementation of credit assistance for development cooperation between the two countries. The two sides agreed there still exists much potential for the two countries to expand their cooperation in culture, education, training, health care and tourism. The Presidents vowed to continue regular cooperation in international forums and organisations, particularly when Vietnam is serving as a non-permanent member of the United Nations Security Council for the 2008-2009 term. President Triet said Vietnam attaches great importance to consolidating and developing the friendship and cooperation with Hungary . He said he believed that Hungary ’s official membership of the European Union and Vietnam ’s economic development and escalating position in the regional and international arena will serve as basis for the two countries to effectively foster their bilateral and multilateral cooperation in various fields. Hungarian President Laszlo said Hungary wishes to continue enhancing the traditional friendship and long-term cooperation with Vietnam , particularly in encouraging Hungarian businesses to increase investment in Vietnam . Hungary considers Vietnam a priority development cooperation partner and wishes to effectively cooperate and share experiences with the Southeast Asian country in regional and international matters of common concerns.